History buffs and cheeky party animals can come together for this night-time cabaret show in the historic Moulin Rouge. Built in 1889 in Pigalle neighborhood at the bottom of Montmartre hill, the venue was meant to be a public gathering place where the wealthy could hobnob with workers, writers, poets, artists, and international travelers. The Moulin Rouge launched the career of artists Toulouse-Lautrec and many dancers of the time. 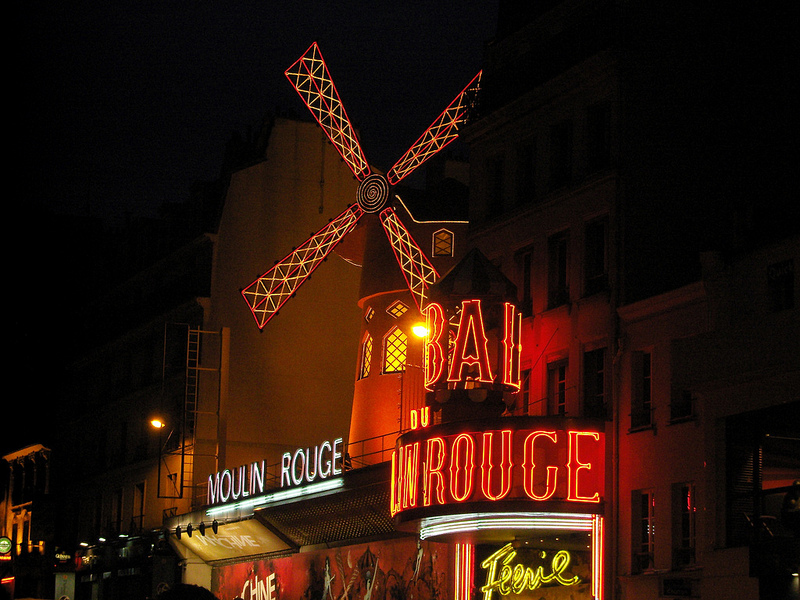 You're sure to see the modern can-can in the show, which is said to have been born at the Moulin Rouge. Today the venue serves tourists who want to experience a bit of the history and magic of the infamous cabaret so yes, it could be considered a tourist trap full of sequins, feathers, and rhinestones, but if you have euro to burn it's fun show. Dinner/champagne + Show at €175-€200 depending on your menu. Just the show itself which will run you €95. Since there is plenty of amazing food in Paris for our money we suggest you skip dinner and grab it elsewhere, it's about the booze and dancing anyway. Despite what you may think after watching the Hollywood movie about the Moulin Rouge, this isn't a bar or club that you can mingle around with other patrons, it's a proper show with assigned and reserved seating. There's also a strict no photo rule once you're inside, and it's held up by security so do yourself a favor and leave the bulky camera at home.